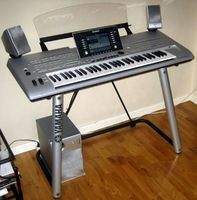 Tyros 3, Keyboard Arranger from Yamaha in the Tyros series. Perpetuating the Tyros line for the third time, Yamaha presents a new, high-technology arranger keyboard that provides a rarely achieved musicality. Some time ago, arranger keyboards were the "poor cousins" of the music industry. Those gadgets became educational tools for children and then for adults looking for strong musical sensations. Today, they are powerful production workstations with a large ROM, sample memories, DTD, USB port, etc. Some manufacturers equip them with technologies developed originally for their workstations, which results in the latter being not so predominant anymore. 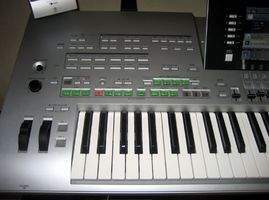 The Korg PA2X, for example, includes a real Triton/M3-like synth. Ketron's Audia is a comprehensive audio loop machine with real-time pitch shifting and time stretching functions. 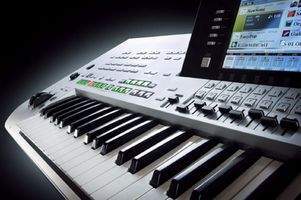 The Tyros 3 is not fancy and Yamaha decided to improve every possible function of the original concept: sound realism, harmonization, FX processor and user interface. Like its predecessors, the Tyros 3 is fitted inside a PVC housing with gray aluminum finish on the top and black finish on the bottom. Considering its price range, I would have preferred a brushed aluminum housing that made it look more classy without adding much weight. Even if it is not made for that, do consider getting a carry case because the part underneath the keys tends to bend if you push on it. The manufacturer offers a very nice-looking one with the "Tyros 3" logo embroidered on it. The FSX keyboard has 61 velocity and pressure-sensitive keys. It's the best light keyboard we have ever tested: straight response, perfect balance and full control. 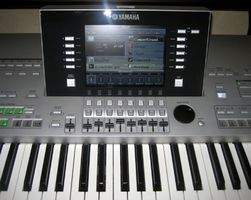 This keyboard is even better than the famous Yamaha model on the DX7, Korg Trinity and Triton... Yamaha has been constantly improving the layout of the different control sections since the first Tyros came out. This time around the layout seems perfectly thought-out. On the left side you will find everything regarding styles and sequences: in the lower part is the style control (intros, variations, breaks, endings, accompaniment modes, tempo, pads, etc. ), in the middle part are the style selection buttons sorted by category, and in the upper part the sequencer controls. You can also find the mic section here: settings, vocal harmonies, etc. Right at the center of the device is the big 7.5" VGA display (640x480 dots). Its active color matrix provides a strong luminosity and an excellent definition. The display is adjustable (but not motorized–as if someone cared). It is surrounded by buttons for selecting sounds and styles, navigating within the different menu pages and direct editing of parameters. It's nice and does its job pretty well. The fact that it's not touch screen is not a problem at all, on the contrary that will help you keep it cleaner. Below the display, you'll find eight pairs of function buttons (to edit values in the menu pages) and nine very-much-appreciated sliders that not only allow you to edit faster with the integrated mixer (more on this later), but are crucial for the modeled drawbar organ presets. As soon as you select one of these presets, the display shows a graphic representation of some Hammond B3-like drawbars, that you can control with the sliders in real-time for live applications. This is a great improvement on the older models and we celebrate it. Last but not least: the right side of the device is dedicated to sound presets. In the lower part you can control the snapshots, the OTS registrations (more on this later), the main L/R channels and the select/mute functions of the different channels. In the middle, you'll find the preset selection buttons sorted by category. The upper part is dedicated to the different effect sections of the presets. And you also have here the direct-to-disc section (more on this later) and the system menus. 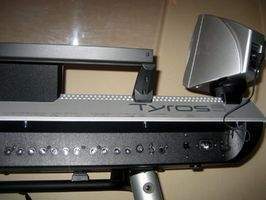 The Tyros 3 is equipped with a LAN RJ45 Internet connection. The connection requires a computer so you'll also need a hub or a router. There's a browser included in the Tyros 3 OS, and you can use the 16 function buttons to control it. You can save links to your favorite pages for later reference. So this actually allows you to download every single free file there is: long live liberty! It goes without saying that the main goal of the manufacturer is for us to buy sound or style banks online. 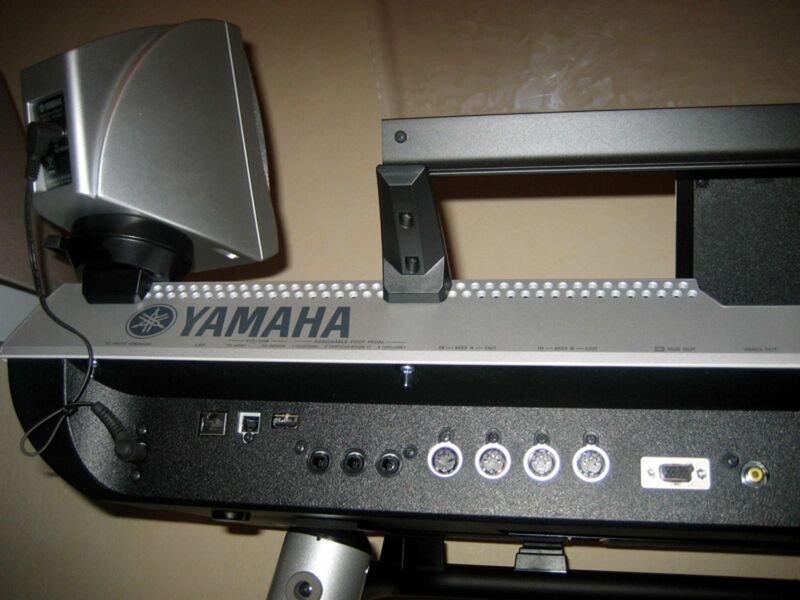 When you go to the Yamaha arrangers' website, you expect to find plenty of new resources for your favorite toy, but you should be ready to empty your credit card as well, given that the current free goodies are limited to a few choir sound banks. Ah, the joys of our consumer society! 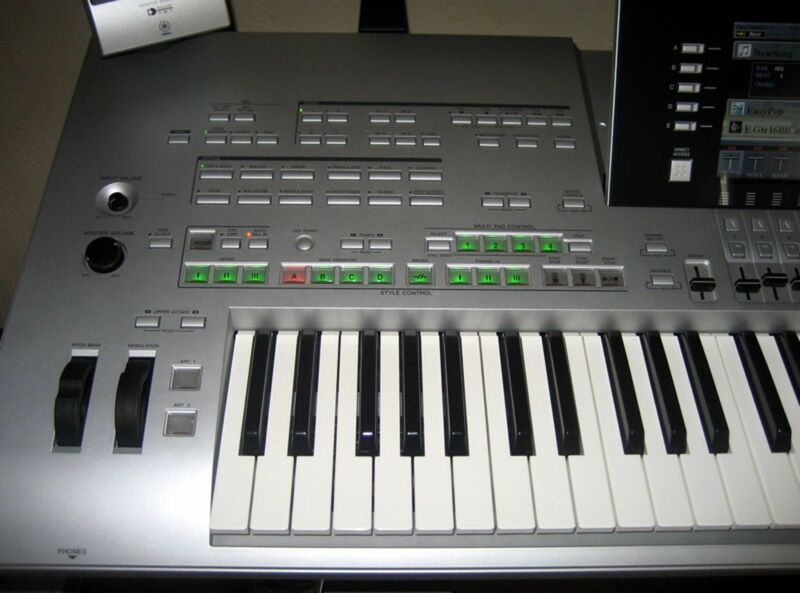 On the positive side, it's quite convenient to have the possibility to download a lot of MIDI files and karaoke songs directly to your Tyros 3 and manage them easily. The connectivity of Tyros 3 is quite impressive and it shows that you have a top-range product in your hands. It starts with the phones and USB-To-Device connectors located on the front left and right side respectively. The rear panel is quite comprehensive: 3-pin power connector (internal PSU, thank you! 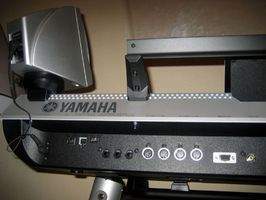 ), stereo line/mic input with gain control, stereo send/return with level control (to connect external audio units like effects processors, turntables and the like), two pairs of assignable stereo outputs, two RGB video outputs on RCA connectors (to connect an LCD display, a monitor or a TV), four MIDI connectors (two in/out), three footswitch connectors, two USB2 ports (host and device), LAN RJ45 connector for Internet connection (see right frame). Lastly, on both ends of the rear panel are connectors for the manufacturer's optional Tyros 2 TRS-MS02 sound system that includes two satellites and one powered subwoofer. The satellites can be fixed to the rear panel of the keyboard for an optimal listening position while the big subwoofer/amp can be set directly on the floor. You will need two cables to connect the speakers to the keyboard. With its two 20-watt satellites plus 40-watt subwoofer and its well-balanced response, this compact sound system provides a quite good sound quality for private applications (in your home studio or living room). For stage applications, you'll need a bigger sound system. The more arrangers improve, the more they become complex! Meaning they are less intuitive, which is a contradiction of their initial purpose. But the Tyros 3 avoids this by providing plenty of convenient functions that make user's life easier. Starting with the OTS function that allows you to manage the unit's global settings (style + left/right-hand section sounds) and recall them by pushing a single button. When you change the style variation (directly or via the AUTO FILL function), the left/right-hand ranges can change simultaneously, either immediately or at the bar defined for the variation change. The display provides you all the time with detailed information (in five languages) about everything that's going on with the device: presets, accompaniments, drawbars' position, etc., so you don't get lost easily. The user interface is very pleasant and full of color: folders with tabs for sounds and styles, a mixer for the different tracks, colored drawbars for modeled organs, etc. The Music Finder function allows you to find accompaniments within a database of 1850 presets, some of which recall well-known songs–these styles are no MIDI files but comprehensive settings for the whole device (styles and sounds) in a given music genre). 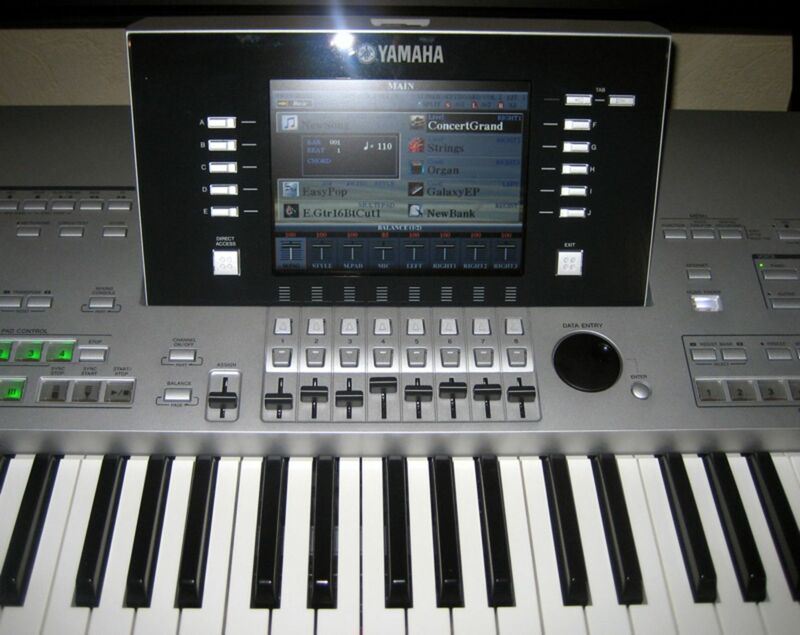 Yamaha wisely provided transpose controls (two to transpose in semitone steps and two to transpose in octave steps), which are very simple but useful for live applications (octave transposition is dedicated to the right hand in accompaniment mode and to the whole keyboard in Full mode). Used as an arranger, the Tyros 3 can play up to three right-hand voices, one left-hand voice, eight style presets and four pad riffs simultaneously for a total of 128 voices of polyphony. When the left-hand part is disabled, the Tyros 3 plays up to three sound layers on the whole keyboard (with or without accompaniment). When enabled, the left-hand channel covers everything below the split point setting. You can even program three different split points to create four sections: chord, left-hand, right-hand 1-2, and right-hand 3. Now, let's listen to some factory presets among the 1500 available sounds in GM2 or XG standard. Acoustic piano presets set the standard very high. For example this classical piano, this jazz rock piano and this soft piano. The Tyros 3 actually uses the dynamic stereo multisampling technology from the last Clavinova models. The result is a realistic, wide and dynamic sound over the whole keyboard range–it is, to our ears, the best piano sound among keyboards, sample players or workstations! We can fully understand the rumor about Yamaha's marketing department having market segmentation problems when this sound was implemented... The electric pianos like the Rhodes, CP80, Wurlitzer and Clavinet sound amazing as well. The brass sections and solo brass instruments sound wonderful too, especially the new delightfully expressive and wet jazz sax. It uses the new "Super Articulation 2" technology specifically developed for the Tyros 3: by automatically analyzing your playing, or manually via the two dedicated buttons on the left side of the keyboard, it allows you to play different sample versions for a same note, not only according to the velocity but also according to note intervals and repetitions. Applications: octave up or down glissando, pitched attacks, legato, vibrato, finger noises, breathing... You will also find a clarinet, a trumpet, a harmonica and a bagpipe with the same expressiveness, thanks to the same technology. The nylon acoustic, steel acoustic and electric guitar presets are on the same outstanding level. They use very musical samples and high-quality simulation effects. In order to recreate the different guitar playing techniques, the Tyros 3 includes multisample layers called MegaVoices whose sound changes according to the playing velocity. This allows you to create realistic rhythms in an accompaniment channel without having to use several software solutions. It's perfect to play the styles provided but very difficult to use for your own programming. Navigating through the different categories, we also got to appreciate the quality sounds of the bass presets, the drum kits (with new dynamic stereo samples), the accordions (essential in an arranger!) and the strings. Among the presets you'll also find a rather good-sounding vibraphone, wood instruments and a harpsichord. The only real disappointment are the classical and jazz choirs, whose sound is outdated and won't be easy to work with. The sampled organs sound good, except for a quite annoying, much too loud and sharp-sounding sample on certain notes of a B3 preset. In order to simulate organ drawbars, the Tyros 3 uses a modeling technology with real-time adjustment of the nine sliders (see frame below). Synthesized sounds aren't at a loss and offer quite convincing simulations of classic synths, thanks to several bass, lead, pad and polysynth presets, including some taken directly from the Motif Series. 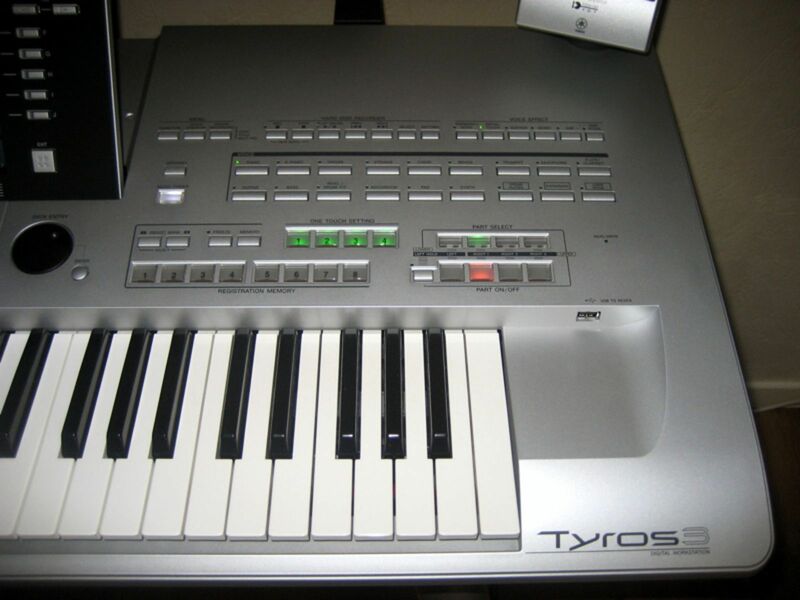 As a summary, the Tyros 3 provides the most pleasant sound set among all sample players we have heard to this day. For comparison purposes, we grade it above the Fantom and PA2X/M3, a bit better than the Motif/Tyros2 and on the same level as the Kurzweil PC3. We cannot give you any information regarding the size of the PCM memory used because Yamaha Japan didn't provide us the data. 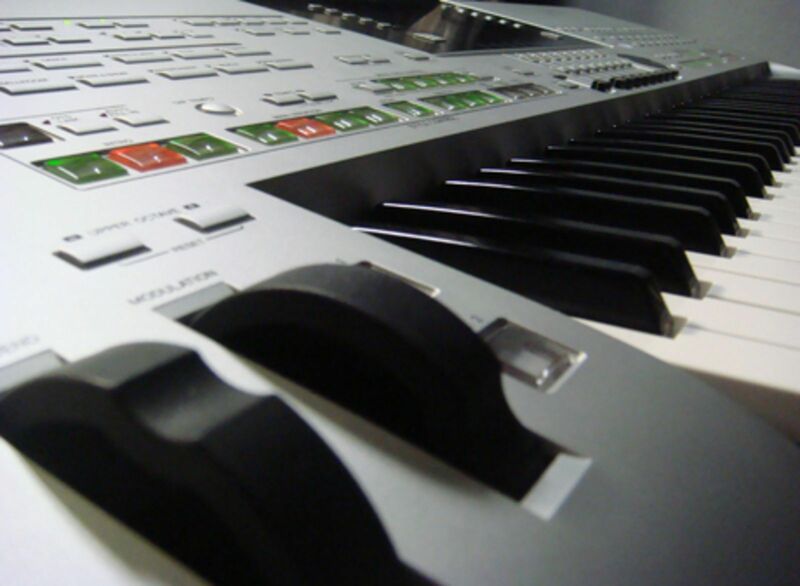 Unlike Korg arrangers that integrate a powerful synth with access to every single synthesis parameter, the Tyros 3 doesn't allow detailed editing directly from the user interface. It's a pity because the display would surely allow lots of things... Thus, you can only access the main synthesis parameters through direct editing: volume, dynamic response, portamento, wheel action on some parameters (filter, amplitude, three LFO destinations), pressure, filter cutoff, resonance, volume ADR, vibrato, reverb and chorus send, DSP selection (preset number and real-time parameter modulation), 2-band EQ and harmony-type selection (added as soon as the harmonizer is activated). There is a dedicated editor for drawbar organs that allows you to control the volume of nine harmonics, the type of organ (vintage or modern), the vibrato (three different depths), the Leslie cabinet (slow/fast), the overall volume, the attack/release time of the percussion, and their response mode (mono or poly). Last but not least, the Tyros 3 gives you the possibility to import stereo samples (WAV or AIFF) and to control their layout on the keyboard. It can import all bit rate resolutions (but converts them into 16 bits) and different sampling rates (96, 88, 48, 44, 32, 22 and 11 kHz). It can even recognize loops integrated in the file, but they can't be edited. In normal mode, you can stack eight element layers. Each element is a multisample in which the samples are laid out (pitch range, volume). You can also create percussion kits either by starting from an existing kit (replacing some of the samples) or from scratch. Unlike the normal mode, samples are assigned one by one and key by key in a single layer and have additional volume, pan and FX send settings. 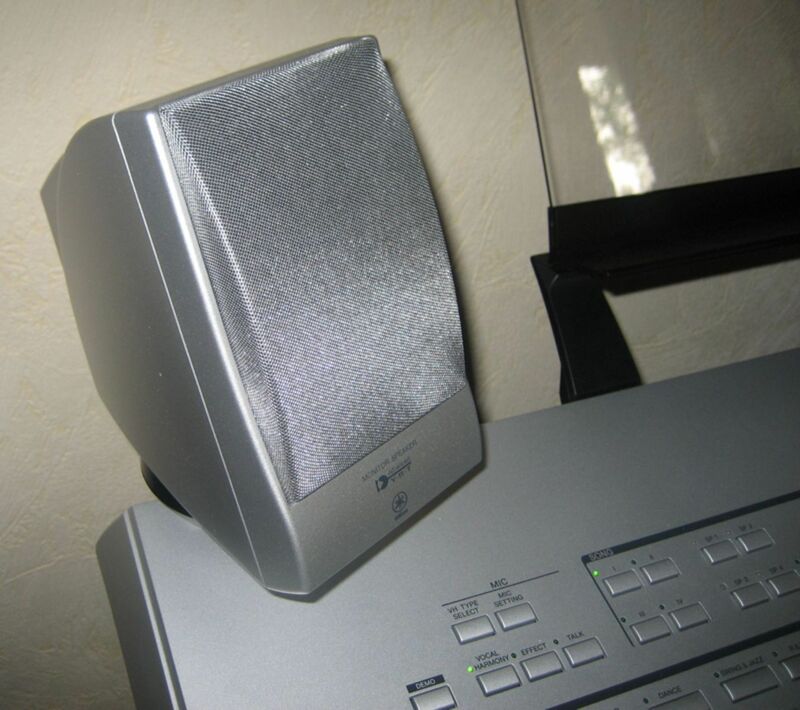 If you want to dive deep into synthesis and have full access to all synthesis parameters, you'll have to use the Voice Editor for PC and Mac provided on the CD-ROM. It ought to be more than enough! As already explained, a "normal" sound contains eight elements. Each element includes a multisample with pitch and velocity ranges, two 6 or 12-pole multimode resonant filters (low-pass, band-pass, high-pass or band-rejection with 4-segment keyboard split), one LFO and three multisegment envelopes. You can modulate numerous parameters in real time, which is an additional advantage. User drum kits have their own editor called Drum Key. It provides less settings but they are available for each key... There's no real reason to complain considering that you can start from an existing kit and change everything you want, especially the sample assignation (mentioned above), via a crystal clear graphic interface. 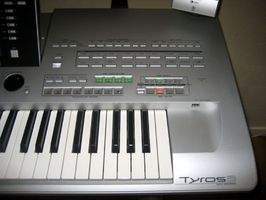 The Tyros 3 includes 450 factory styles in the internal memory, while the hard drive is desperately empty... All music styles are available and sorted in different categories: Pop&Rock (AcousticRock, ContempPop, ContempRock, EasyPop, HardRock, Live8Beat, SouthernRock, Unplugged1&2, VintageGtrPop), Ballad (16BeatBallad2, 80’sBoyBand, AnalogBallad, ChillOutCafé, R&BSoulBallad), Dance (6-8Trance, 70’sDiscoFunk, Electronica, FunkDisco, Ibiza2004), Swing&Jazz (Charleston, DreamyBallad, JazzGtrClub, ModBigBandShfl, ModernJazz, MoonlightBallad), Rythm & Blues (GospelSisters, Rock&RollShfl, Skiffle), Country (70’sChartCntry, BlueGrass) Latin (BossaNova, BrazilianSamba, GuitarRumba, RockChaCha, SheriffReggae), Ballroom (Tango1, TheatreMarch, VienniseWaltz), Movie&Show (MoviePanther, RomanticBallet, SaturdayNight, WildWest), Entertainer (8BeatAdria, Caribbean, DiscoFox, DiscoHands, ScanBugg) and World (OberPolka, Sirtaki, Zouk). This classification seemed to us less intuitive than it appears. In fact, a music style can be included in several categories: Disco for example is present in the Dance, Latin, Movie&Show and Entertainer categories. You'll have to get used to it. 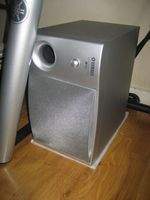 Styles have been improved compared to older models because they benefit from the extended sound range (e.g. the drum kits), the FX section that allows you to manage several separate DSPs depending on the rhythm part, and from the powerful chord detection system that can manage 38 chord types with up to six notes (for players with a very good left hand). When the arranger is active, you can harmonize with the left hand or with the full keyboard, with or without bass inversion, and according to different more or less simplified fingerings (it's amazing how many things you can do with only two fingers... and the Tyros 3). Several harmonization rules allow you to define the intervals for each harmonized note of the different chord variations (see below). In short, the results sound very authentic, subtle and musical. Each style includes three intros, four variations, four fill-ins, one break and three endings. You can start a song directly or with an intro or fade in. To make things easier, you can make variation changes with the AUTO FILL IN function so that the progression is perfect and musical. While you're playing, the four programmable pads are very convenient to trigger a percussion, an effect or a riff (from the 123 internal memories or from the user memories) synchronized to tempo (as loop or single pass). Way beyond old-time arrangers. For smooth finales, nothing better than a fade out. And to amaze the crowd, just use one of the three more or less complex endings. The Tyros 3 offers lots of flexibility for tempo management: when you change the style, the new style either syncs to the current tempo or changes to its initial default tempo. Two buttons allow you to edit the value directly–a rotary control would have been much more convenient and faster, however a dedicated "Tap Tempo" button gives you the possibility to enter the desired tempo immediately. Finally, do notice the right-hand harmonization function which depends on the chords played with the left hand. This amazingly powerful function has 26 different playing styles and is saved within each preset. You can now do Moonlight Serenade with only one finger! Tyros 3 allows you to program and save your own styles. A style includes up to 15 rhythm sections with eight channels over 32 bars with a limit of 120 kb per style. To program a style you have three programming options: real-time with overdub, step-by-step, or style assembly. You can select the scale and chord for programming, and the default value is CM7. There are plenty of standard editing tools: quantization, event deletion, copy / insertion / deletion of bars, velocity change, etc. In order to increase the feeling, you can edit the groove with standard swing functions and with a very interesting Push function that causes beats to be delayed or anticipated in order to add some "imprecision" to the tempo. Not bad at all! But clearly the most daring part is the management of complex chords with harmonization rules that can be set for each track depending on the chord variations played. For example: how the bass reacts to chord inversions, how the chords are replayed (inverted or not, with pick scrape or as an arpeggio, etc. ), how melodic phrases are transposed, how major, minor and seventh chords are harmonized. In this last case, the Tyros 3 can manage alterations of different intervals when you turn to minor (flat or sharp third, fifth, sixth, seventh, etc.) depending on different basic harmony rules: melodic, harmonic, natural, Dorian. It's an alternative to some arrangers that provide only fixed variations for major, minor and seventh chords, which forces you to program three or four times more variations without having the possibility to harmonize every chord type. We prefer Yamaha's approach that uses harmony rules based on a single major chord, making the use of complex combinations faster and much more musical. Finally, do notice that the Tyros 3 is indirectly compatible with the whole Tyros/PSR9000 style range. You'll need software tools–provided for free by the manufacturer–to do the conversion and it may require several steps to achieve your goal, but it's doable. The Tyros 3 includes a 16-track sequencer with 16 MIDI channels and 300 kb capacity per song (over 100,000 notes). It allows you to read standard MIDI files (with score display and scrolling) and karaoke/text files (with lyrics display and scrolling). You can have displayed simultaneously two channels of your choice (G key, F key), guitar chords and lyrics on the same score. Time signature and note quantization can be edited, as well as note color and zoom factor. For playback you have four assignable markers and the possibility to loop between markers. There's also an option to play back all songs within a folder either continuously or randomly, like a playlist. And a learn function allows you to "enslave" song playback to the notes you play or sing (song playback pauses as long as you play the wrong note or sing out of tune). You can also record your own sequences using two different methods. The first one, called "Quick Recording," allows you to record live performances played with the arranger directly into the 16 tracks: four left/right-hand tracks, four pad tracks and eight tracks from the style. Once you finished the multitrack recording, you can save it into the internal memory, the hard drive or via USB. It couldn't be easier. The second method is step-by-step recording: enter the notes one by one with pitch, velocity, position and duration; afterwards enter the chord progressions for style tracks. You can later edit in real time (with punch in/out) or step by step (note list, chord progression and SysEx editing). In case you choose the latter, event filters allow you to do the job without losing time with jam-packed lists. A noteworthy disadvantage of the sequencer is that it is conceived for an arranger, in other words, it is based on a right-hand melody and an automatic harmonized accompaniment following a chord progression. It differs from workstations whose sequencers allow you to record each track from scratch. We also regret that it is impossible to transfer some data directly between arranger tracks and sequencer tracks. One of the main flaws of most arrangers is their FX section. Quite often you'll find yourself missing dedicated DSPs to process several parts of an accompaniment simultaneously. The Tyros 3 defies this tradition with no less than nine dedicated DSPs, a global chorus and reverb, plus master compressor and EQ. Global effects are assigned to two busses with adjustable sends on each channel, while multi-effects are directly assigned to the parts: two DSP to rhythm parts, one to the mic input, four to the left/right-hand parts, and two to the sequencer tracks, with some combinations and subtleties we won't deal with here but which allow even more flexibility than it seems in first instance. All effects are powerful multi-effects that provide up to 16 parameters. some of which some can be edited in real time. You get plenty of presets so you don't have to edit everything from scratch: 42 reverb presets, 106 chorus presets (with reverb, delay, flanger, Leslie) and no less than 272 presets for each one of the nine DSP. You've got everything you need to have fun: reverb, delay, chorus, flanger, phaser, distortion, amp simulation, rotary speaker, enhancer, lo-fi and many effect combinations. You can also harmonize anything that comes into the mic input, especially your own voice, depending on the chords you play to control the arranger. There are no less than 60 vocal harmony types available in several music styles (country, jazz, classical, vocoder, etc.) as well as ten user memories. Last but not least, the master compressor has five presets and five memories (type, threshold, ratio and gain controls), just like the master EQ. This section is very powerful and sounds extremely good. The direct-to-disc function allows you to record one stereo track via the audio inputs or to import a file from an external USB storage device. There are two stereo tracks for playback. It works at 16 bit/44 kHz. Once the tracks have been recorded you can process them with standard tools: normalization, volume adjustment, delete, replace, programmed punch in/out, manual punch in/out or via footswitch, etc. A playlist allows you to easily manage a song list to be played in a given order. Lists can be freely edited and sorted. It is really easy to import a new song and rearrange all songs–with up to 500 files per list! The lists can then be saved in the internal (or an external) memory to be recalled anytime. The Tyros 3 allows you to open the voice mixer whenever you want, so you can control and see a graphic representation of all used channels. You can monitor the mix of all output signals by pushing one single button: three right-hand sounds, one left-hand sound, eight accompaniment channels, 16 sequencer tracks, four pads, one mic… Different mixers are available so you can adjust in a matter of seconds parameters like volume, pan, a 2-band EQ, pitch / portamento / filter cutoff / resonance (only for the four left/right-hand parts), reverb and chorus FX bus send, FX selection for the different tracks (nine independent DSPs), master EQ, master compressor, and audio output. As a last remark we should mention that the Tyros 3 can manage different microtonal scales quite smoothly and they are fully editable graphically. There are also nine presets including oriental scales. And don't forget the keyboard, with five velocity and three pressure curves. The Tyros 3 is the result of top-quality improvements that started years ago. It has been a long way since the first version of the product. Its indisputable musicality is the instrument's most outstanding quality–leaving the competition far behind, especially when it come to the new SA2 sounds and their unique expressiveness. The styles also gained more sound realism thanks to the new drum samples and the generous FX section. 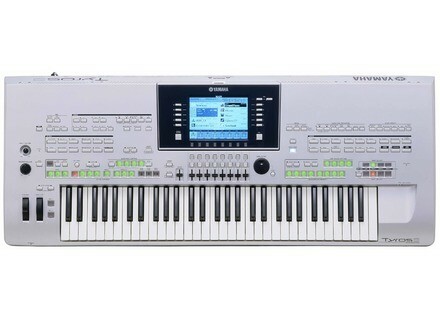 The 61-note keyboard has an exceptional quality but unfortunately there's no 88-key version available. In spite of its impressive number of settings, the Tyros 3 is highly ergonomic and easy to use, making it the ideal solution for professional stage applications. People who like to mess around with sounds and styles will not be disappointed either, and the Tyros 3 is also a nice studio tool. However, we regret that the sound synthesis was "outsourced" to a software (considering the size of the display), and that the sequencer is based around the arranger. The all-plastic assembly and the few accessories provided are also disappointing, considering the price of the product. But our overall impression is very positive. When you start one of the styles of the Tyros 3, you can't help putting your fingers on the keyboard and start beating the floor with your foot... it's easy to be inspired!